After my little triumphant making of my first tsuke obi I thought wouldn't it be a good idea to make another one for someone else to enjoy! Like before it is reversible so you can alternate how you wish to wear the colours and at the front you can twist your obi to create interesting contrasts. 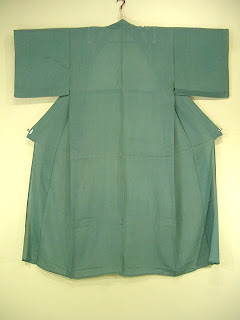 As it is a tsuke obi, it has been designed for the single fold otaiko. However I have made it long enough so you actually create a double fold otaiko as well. And if that is not enough, you can even tie tsunodashi musubi for a more casual look. You can even create otaiko variations if you like. As I have only used a heavy weight interface to line the obi, you can tuck the tesaki part towards to back and create a different otaiko musubi look. 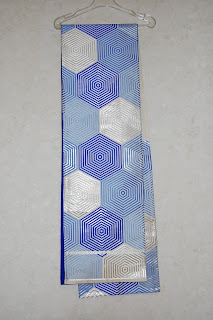 This wonderful handmade obi can be yours for £30 (not including postage). I hope to find other materials to make more obi because they are a lot of fun to make. There is nothing better then creating a kanzashi for a bride and last week a bride contacted me to ask me to create a kanzashi for her special day! Cherry Blossom was her chosen kanzashi however she wanted it completely white! I couldn't disappoint her so here is the same kanzashi in white. Everyone talks about them and since my partner has to organise seminars for his maths department, he normally volunteers to make the first batch of cakes for the tea and coffee afterwards. By volunteering, this normally means me making something that 20 people can eat and survive therefore this time I made red velvet fairy cakes. I had to try 5 of them to make sure they were nice enough but then most cake taste nice when they are warm. But you can not have red velvet cupcakes with frosting and taking my friend's advice I made butter roux frosting. This frosting is a lot lighter then the standard cream cheese frosting and because you mix in a roux mixture to bulk out the butter and sugar frosting, it is marginally healthier! Now to combine the two together. I don't have an up to date picture of my collection but this was my collection a year ago. and since I moved to Sheffield my kimono have been living in 4 large (50cm x 30cm x 23cm) and 2 small (34cm x 27cm x 23cm) plastic boxes. I am not going to start counting how many items I got because I might faint. 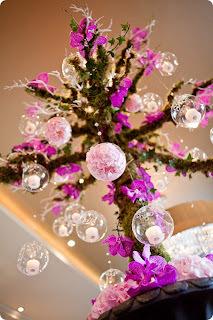 I love the work of Yamamoto Yumi! 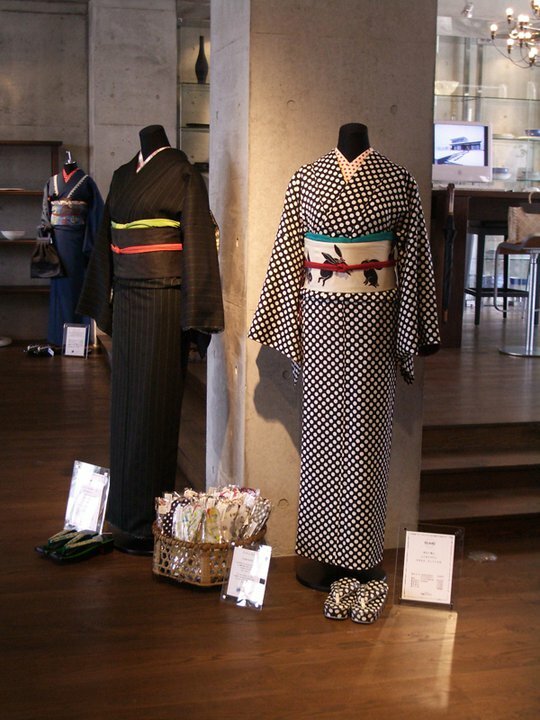 She makes kimono, obi and zori from modern print fabric which means her kimono look really funky. Don't you just love this outfit? It is just perfect for the seaside. 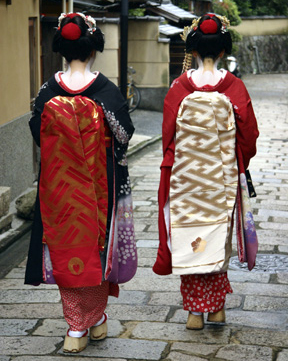 Even her more traditional looking kimono outfits still have a modern feel to them. However I do like to experiment and I love combine boots with kimono because zori/geta are not warm enough for the UK winters. I have my trusty tan boots which are great for kimono! When it comes to clothes, my ethos is if you buy it then you must wear it. Which I apply to my kimono collection as well but my biggest fear would be destroying a kimono that I love while wearing it out. Either through staining it with makeup or food I would be heartbroken if I made a kimono unwearable because I am one of those fools who gets sentimental about inanimate object. Fortunately however I have not encountered this problem yet. Back in September 6, I went to the first BUNTweetup in Yorkshire and had a bundle of fun. However I didn't take any pictures!! Well Bride Up North came through and here are some photos from her site. 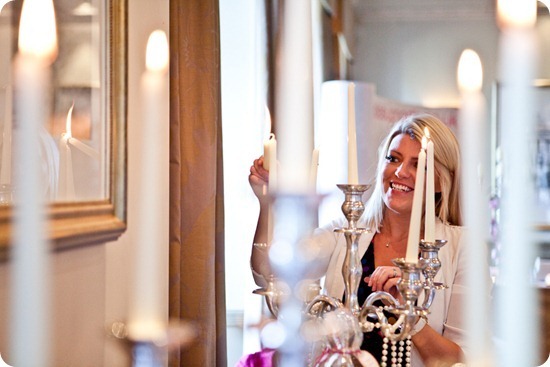 Here is the lovely Julia getting things ready! This was the lovely centrepiece in the middle of the room. Yep that is me wearing my purple kanzashi, it is becoming the kanzashi that I wear for special occasions. 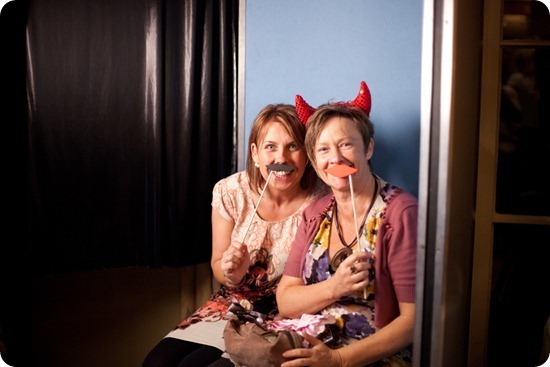 Some attendees who were having fun at the booth. The yummy sweetie table which I was very good and didn't eat anything. I don't need help to be unhealthy because it is programmed into my genes. 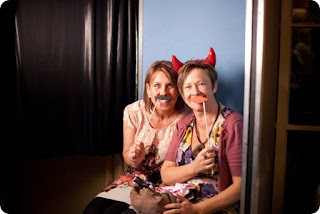 For more photographs of the evening then you can visit Brides Up North website here. And now I can relax (a bit) from thinking about my wedding and concentrate on EMS! My bouquet is made from the same flower designs as the rest of the boutonneire and hair pins because I wanted all the elements to co-ordinate with each other. The only addition I made are the 3 lace roses which were included because I wanted lace roses and they helped with the arrangement. In previous bouquet, I would find odd gaps which were unattractive and it dawned on my that I could eliminate them if I had a flower which could be slotted in. Like with my other bouquets, I used a lot of floral tape which creates a stable handle which is covered with white satin ribbon and with the remaining lace I create a double tier covering for the back of the bouquet. And here is the wonderful bouquet being held by my partner like as if he is about to bludgeon someone with it. I think at the time we were talking about the bouquet making a lovely hand guard for a sword so we spent a couple of minutes thinking what it would look like with a blade sticking out in the middle. Question to my readers, would you people be interested in buying such a bridal sets? And if so, what price would you pay for it? What do you like and don't like about kimono. 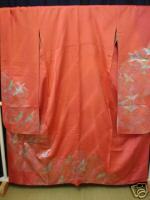 The best thing about kimono is the variety styles and materials available. Really I can't think of any other garment that has such variety! 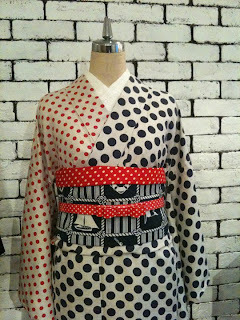 From the heavy decorated furisode. To the teal ro iromuji. There is a kimono for everyone's taste. Another thing that I love is that you can create lots of new outfits from one kimono. 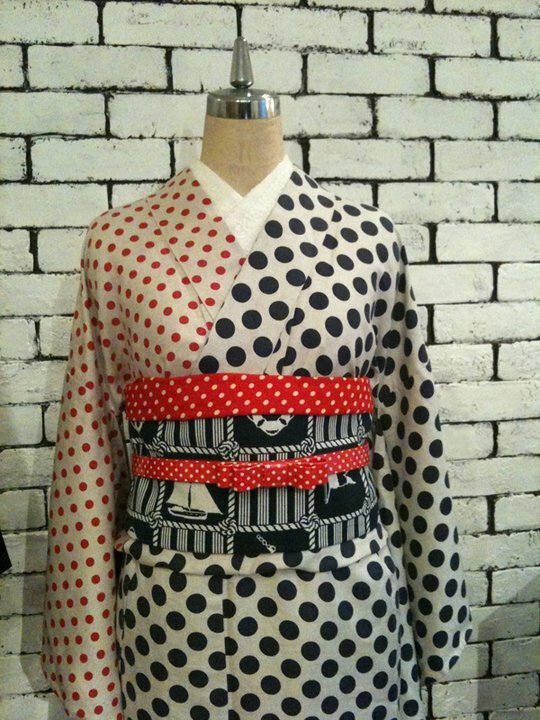 Lets take my polka dot kimono which I love. 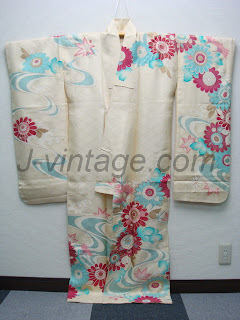 I first wore it with a black ro obi with a pink and white obi-age and pink obi-jime. 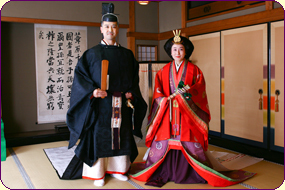 Then with a little bit of lace and a different obi, obi-age and obi-jime it is a completely different. I really should wear my kimono more often but it would mean buying more obi. Now the pet peeves! The amount of accessories you need to have before you put it on. 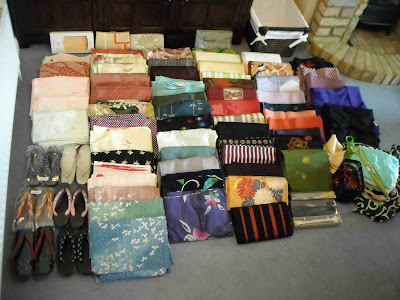 It took me ages to buy or make all the correct kitsuke items to wear a kimono which meant a lot of time and effort. Then of course once you start buying kimono, it becomes an addiction! This was my collection after only a year and a bit. Since this photo I have brought a few more pieces but when I look back at it I must have been mad or something. True I have worn pretty much everything at least once in this photo but if I did the same thing with western clothes I think I would be broke. Thank god for Ebay bargains. Another weekend has past and on Saturday, my friend (Liz) and I were invited by Alcon to present a kimono demonstration and run three kimono workshop. Fortunately Alcon was based in Leicester at De Montfort University so it was fairly close for both Liz and I to travel. It was a packed Saturday schedule and unfortunately we were assigned the 10.00 slot for our kimono demo which meant we didn't have a packed audience. It appears the night before there was a rave so clearly 10.00 is far too early if you were hungover. Also we clash with the Tea Ceremony. However despite our low turn out we gave our talk and we first went through a furisode kitsuke with a bunko style musubi. The kitsuke went very well despite my forgetfulness. I accidentally forgot the obi-shin and makura however the obi I used was very stiff to the obi-shin was not need and since I tied a bunko style musubi, the makura was not needed. For the next kitsuke we did a maiko cosplay. 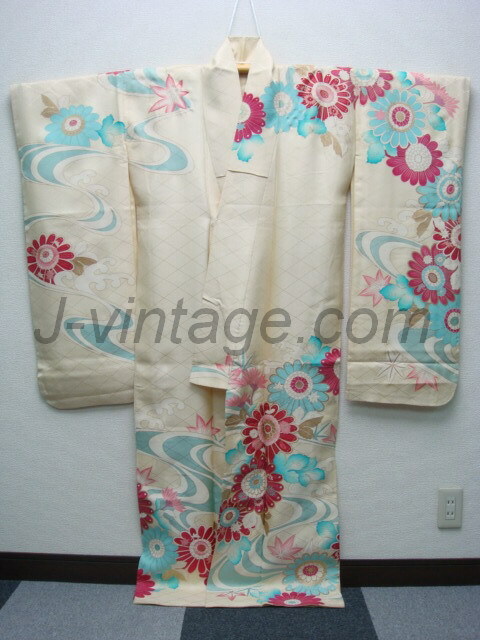 We choose a furisode that could double up as a hikizuri so one less kimono to bring. Also as the model was slim, I was able to fold the kimono with the front opening nicely. The hardest thing was tying the darari musubi style with a fukuro obi because I needed to judge length of the trailing part. In the end the difference between the tails was only a couple of inches which isn't bad considering I have not practice on the model before. Of course as I forgot the makura the musubi was a little flat but I hope I managed to create the look well enough. Now we had 3 hours to relax before the workshops so Liz and I sent the time wandering around the convention. I was surprised how small the event was and with the dealers room opening at 12.00, Liz and I decided to walk around the university. But by the time we got back in time for the room to open there was already a queue to get in and it did not disappear until 14.00 which was the starting time for our workshop. However I probably wouldn't have brought anything so I'm not upset. So the workshop. We knew from the forum that we would have plenty of interest and the first workshop was packed! 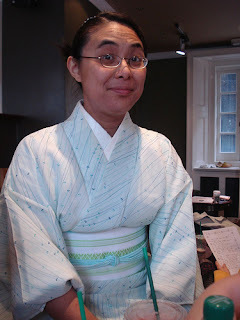 I demonstrated at each 40 minutes workshop how to put on a female yukata while Liz helped the male side. We were both very busy and it was lucky that we were moved to another room which was not being used because 40 minutes is not long enough to tutor people in yukata. And we over ran by 15 minutes which isn't bad. Also we also were unable to cater for women who were plus size because getting yukata for plus size ladies is hard. However I was able to tell them the method of putting on a yukata which they can used when they are able to find one that fits. Overall we did very well and everyone said that they learnt a lot. We even manage to sell a couple of items so that was a bonus. Next event that you will see my friend and I will be at the Entertainment Media Show! By the way photos will follow as I need to get them off an observer who was kind enough to take pictures for us since we were to busy with work. Thank you Colin! Oh dear this is where my lack of photos may let me down but I will pick out my faves. Here is the most traditionally coordinated outfit I have done and it was for my friend's wedding in Glasgow. It was lucky that it was a nice sunny day or I would have spent the whole day worrying about the kimono. All the colours and flowers matched nicely and I provided a flash of colour to the proceedings. Ah then there is this outfit, a nice cool looking outfit which was lucky because Japan Matsuri was packed and wearing ro was best decision I made. I'm sure I have other outfits which I love but didn't take pictures which is a shame. However I have them in my memory and maybe when I have time I will dress up Miffy in them. Three down, nine left to go! When it come to kimono items the least used is probably these two. The first one is an obi that I brought thinking that it was perfect for co-ordination. How wrong I was! I have only worn it once and I only worn it because I was desperate to wear this obi at least once and I couldn't find another obi to match an outfit I wanted to wear. 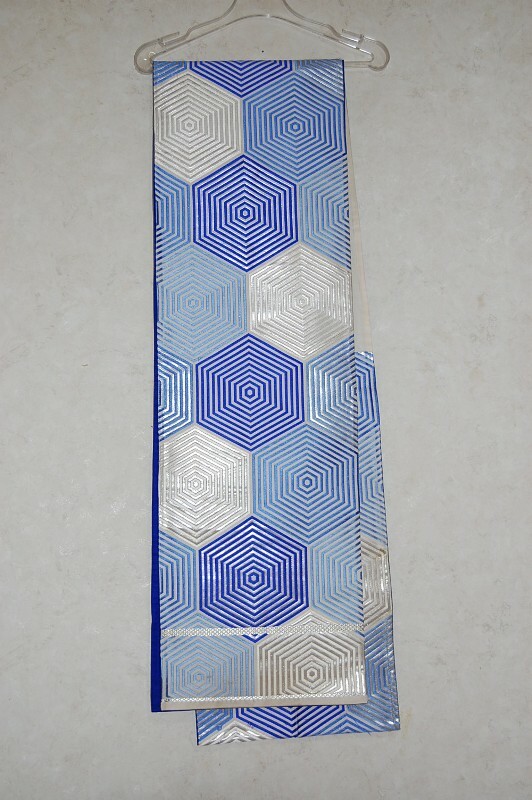 It is a lovely fukuro obi but you do get a little blurry eyed if you stare at it for too long. The second thing that I rarely use is my biyo sugata obi aid. Again I have only worn it once for a party but I have play around with it, creating different musubi. It does take its toil on the fukuro obi I used so I haven't been using it lately as I need to buy a better obi. Carrying on with the challenge questions. It will have to be my comfy zori! They are the best footwear I have ever brought in my life because they are so nice to wear. 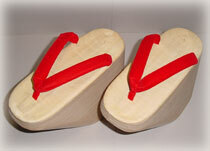 First off the hanao are the padded sort which means they do not cut into your feet which for a walker is very important. And secondly, these zori do not have the usual metal staple at the bottom of the sole so I don't have to worry about it rusting if I step into a puddle. In fact, I must buy another pair of this sort. 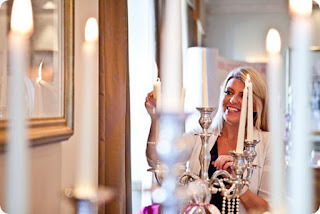 I had a wonderful night yesterday attending the first Brides Up North Tweetup in Yorkshire and it was a fab turnout. 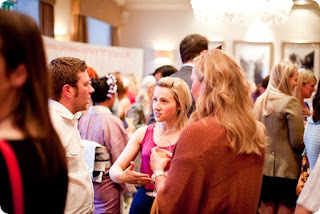 Normally I would find these sort of gathering daunting because I'm a shy person in social situation. However I felt at complete ease and picked up a load of business cards! I think in total I picked up 19 business cards out of 80 which isn't bad. 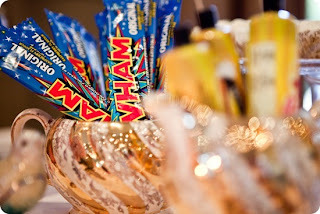 The venue was the mansion at Roundhay park it was picturesque! The leaves were only just turning a different colour and the light was warm. And the mansion itself lovely as well I wish I took photos of the place but I was anxious to get started with the networking.The tweetup was in one room but it was fabulously decorated I will have get the pictures off brides up north website. Of course I had to wear a kimono because I wasn't going to the kdj September meetup. 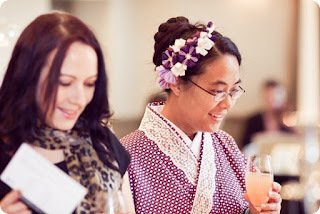 Therefore I wore my favourite polka dot kimono with the added lace and my homemade obi. There was another good reason in wearing a kimono and that was to stand out in the crowd and by god did I! I'm sorry for the dishevel look but I have been on a 1hr and 20min train journey and I was very tired. I got talking to a couple of dressmakers who loved my kimono which provided the ice breaker to discuss our business. I think I made a good impression and a lot of the people liked my kanzashi so this gives me hope that what I am doing is worthwhile. I hope the people I met today will recommend me to their brides! It was a shame that I didn't stay over in Leeds because I didn't get a chance to meet everyone. But hopefully I will be able to connect with them twitter in the coming months. Well done to Julia for organising this wonderful event and I hope in future we will work together. 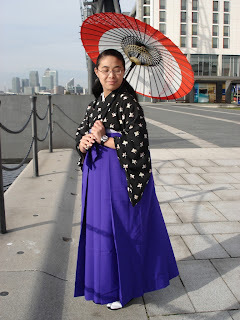 So I was reading the many blogs that I follow today when I saw on Strawberry Kimono a Kimono Challenge! It appears that Kira Kira Kimono set herself a challenge on answering the following questions. How could I resist so here goes. How did you discover and got into kimono? I have a vague memory of seeing a kimono on tv as a child all those many years ago and I think that was how I discovered kimono. I think it was the sleeves that attracted me to them because as I was growing up, I was always drawn to clothes which had long flowing sleeves like hanfu and medieval gowns. 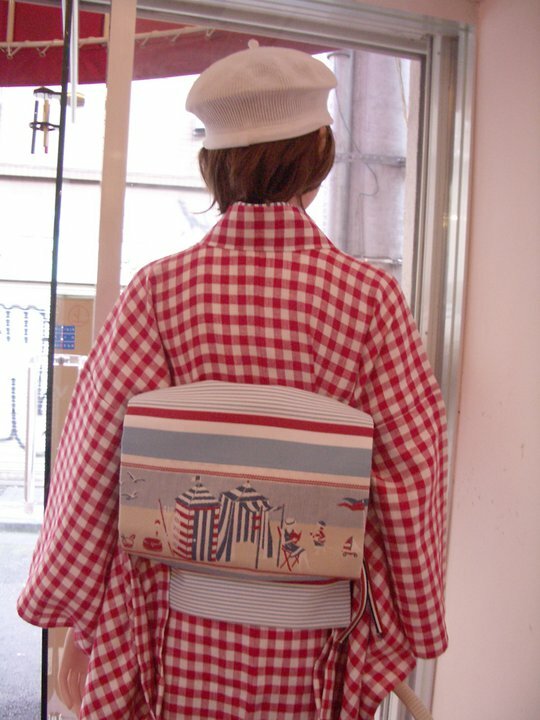 Of course I never acted on my interest until 2006 or 2007 when I discovered Immortal Geisha website where for some reason I wanted to learn more about kimono. Don't ask me why I had this urge to learn, maybe I was bored and wanted a challenge, whatever the reason I began to research into kimono. It was also this time I discovered kanzashi and began to make those for fun! I didn't actually buy my first kimono until 2008 on ebay and it was this one! Which I didn't wear until the following year for Tokyo Day in London as I spent a year getting all the necessary accessories to wear kimono. As you can see it is not the most exciting kimono but it was my first one and therefore has a special place in my heart. For the next year or two, I went on a slight kimono buying spree which I am glad to say has stopped due to financial and space constraints. Tomorrow I will answer question two! So I have been toiling away with my flowers and I have my buttonhole flowers complete! Three purple ones for the the groom's family. And three ivory ones for the bride's (i.e my side) family. One of the ivory one is for my maid of honour as has been attached to a hairclip for her to wear on the day. Now I just need more fabric to make my bouquet which is on the way!